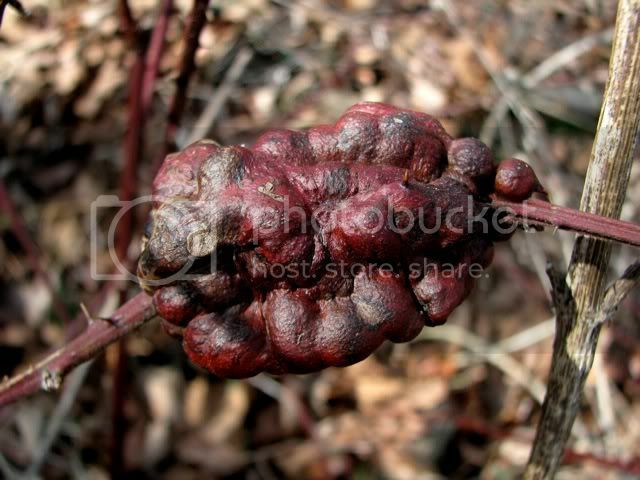 A gall is an aberrant growth on a plant. Typically these are caused by an insect, and the growth acts as a rearing chamber for its larvae. How does the insect get the plant to grow it a nursery? The insect, usually a tiny wasp or fly, injects the plant with a poison of sorts. This photograph hints at the underlying chemistry. The injected compound is likely a mimic of the plant's own growth hormones. In this case, it looks like the signal to grow a fruit was given to a blackberry stem. The fruiting hormone, when expressed in the proper tissue, triggers the production of a cluster of juicy orbs that will ripen into the black bear's favorite fruit. When expressed in the wrong tissue, the resulting growth is more tumorous than tasty. Many galls appear to be fruits growing where fruits shouldn't grow, but sometimes they look more like an aberrant flower. The common oak gall, a hollow globe, may be what happens when you ask a leaf to grow an acorn. For an insect, a gall is a safe home. For a naturalist, they are lessons in gene expression and developmental chemistry. While assessing the risks and pace of climate change remains a difficult task, our core understanding of the physics and chemistry of the atmosphere grows ever more complete. Last month a new study was published that helps explain why surface air temperatures have not increased as rapidly over the past decade as have ocean temperatures. According to NOAA researcher Susan Solomon and colleagues, the stratosphere has dried by about 10 percent since 2000, resulting in a 25 percent decline in surface temperature relative to what would have been without the drying effect. The Economist published a good review of the paper. This research is largely observational. The authors are not sure why less water vapor passed through the tropopause into the stratosphere, and this will surely become an object of study. Climate scientists suspect that increased thunderstorm activity in the tropics caused the drying, with more water vapor exiting the troposphere as rain rather than rising into the stratosphere. Why there were more thunderstorms is not known, but increased variability in weather is one of the basic predictions of global warming. Atmospheric heat can either dissipate into the oceans and land or it can get converted to entropy. Storms are weather patterns that become organized, thus they represent energy becoming organized into entropy. The most persistent and destructive effect of global warming is thermal expansion of the oceans. Most of the heat that has accumulated in the past century has wound up in the oceans, not the atmosphere, and sea level rise threatens people and economies more than storms. More frequent and powerful storms are a bad thing, but this new study shows there may be a silver lining in those storm clouds. They consume energy and act as a buffer against warming. An ivory gull was spotted last week in Georgia at West Point Dam, north of Columbus on the Alabama border. 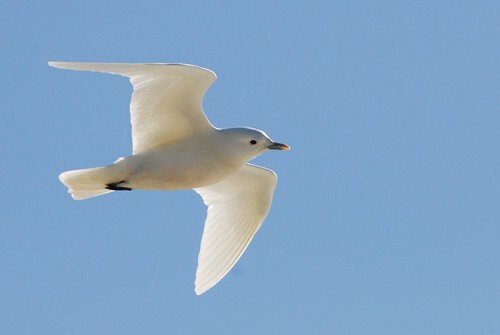 This species of gull rarely leaves the Arctic circle, even in winter, though there are many records of vagrant individuals along the East Coast and around the Great Lakes. This was the first record of the bird in Georgia and one of the most southerly sightings ever. Twitchers drove from several surrounding states to see the gull. Sadly, the bird was injured, apparently by a bald eagle, suffered a broken wing. Rangers captured it to provide veterinary care, but the bird died before it could be treated. It was taken by the U.S. Fish and Wildlife Service for study. To my eyes, male cardinals stand out like they want to be seen. Several resident birds have red markings, including several woodpeckers. None are as brilliant as a cardinal, but a pileated crest glares like a tanager from the woods. 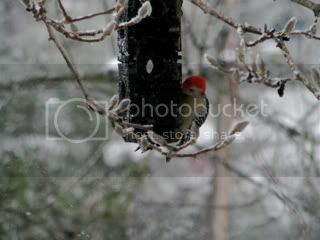 Red-headed woodpeckers, more common at lower elevations, also have bold red on their head. Red-bellied woodpeckers sport a full red cap, and flickers wear a long red teardrop that wraps around their head. Downy and hairy woodpeckers have a bright red square on the back of their head, males only. This prevalence of red makes me wonder whether predatory birds have good color vision. Blindness to red is the most common form of color blindness in humans, and red may be more difficult to see than other colors. Color vision requires pigments, proteins that fold into shapes that reflect or transmit certain wavelengths of light, and red pigments could be less common or more fragile than proteins that enable perception of green, blue or other colors. You don't spot birds by looking for colors; you see their movement, track them and find them where you think they perched. 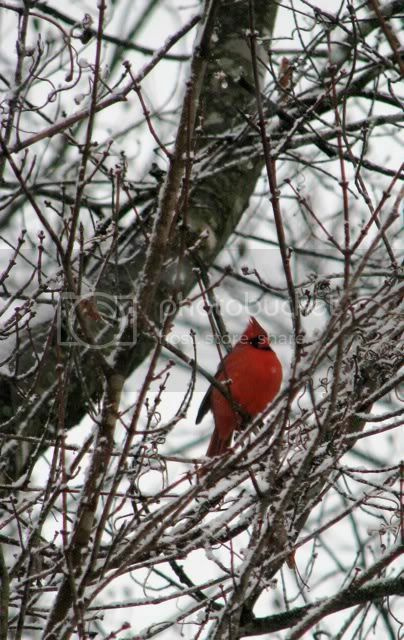 Cardinals, males especially, are much easier to spot than most birds, but they can still hide if they hide still. Their preferred habitat is tangles of brush and hedges. Accipiters like sharp-shinned and Cooper's hawks eat birds almost exclusively, and both will kill a cardinal given the chance. Dense branches are impenetrable protection against stooping hawks and owls. Accipiters prey on cryptic birds at least as much as birds with red markings, and they surely hunt by detecting movement, not color. We know hawks have powerful eyesight, so adding red to their visual repertoire offers marginal advantage. Maybe smaller birds use red for gender and species markings because primary predators lack pigments sensitive to red.